Do you see what I did there with the title this afternoon? Got to love a little play on a book/movie title! Today’s post is a tribute to my love affair with list making. Ever since I was little, I’ve loved getting a new notebook, and once the initial fear of writing in it (the panic of making a mistake and spoiling the first page is very real, am I right?) subsides, I love to make lists of any kind. As a student, however, a to-do list can actually be one of the most useful things you can do to help yourself take charge of your workload. Whether it’s a to-do list for school, university, work, home, whatever – here are, what I consider to be, the perks of writing a to do list! This seems like I’m stating the obvious, but it’s true. Having a to do list on paper, or on your phone, is much more reliable than keeping it in that head of yours. Why? Because that paper or note on your phone won’t get distracted by texts from friends, new episodes of something on Netflix, or even just something as simple as popping out the shop to buy groceries. It’s natural that when you have a lot of work to do, your brain picks and chooses the pieces to prioritise – if you write everything down, there’s less chance that the last minute presentation your tutor scheduled just a week in advance will be forgotten about! Especially during your assessment periods, whatever you’re studying, it’s easy to become a little overwhelmed. With essays or reports due in for every class, and time dedicated to prepping for group presentations, with exams looming, it’s very natural to feel panic stricken. You might start to think there is no way you’ll manage to get all of this work done, because your mind runs away with it and distorts it. By writing everything down in a to do list, you can see exactly how much work you have to do, and by when. Of course, it’s still a lot, but it becomes much more manageable when you have a list of dates to work towards. You can start to prioritise more easily, and set specific blocks of time aside for specific projects, instead of sitting in the library, staring at seven folders for seven different classes and not knowing where to begin! 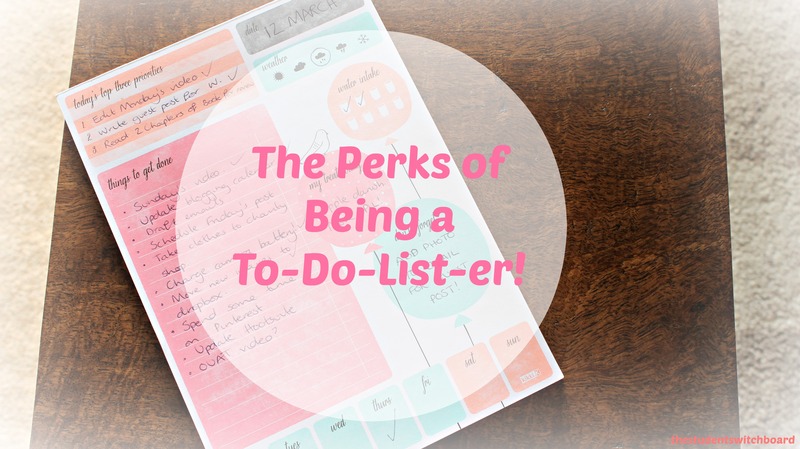 There’s a huge sense of satisfaction in ticking things off a list! It’s hard to explain, but there really is something satisfying about ticking things off a to do list! Having a physical list of everything you have to do, and scoring or ticking things off can make you feel much more in control of your workload. Seeing things disappearing from the list creates a sort “light at the end of the tunnel” feeling, and there’s a massive sense of relief when the first item goes – it signals that you’re on your way!! Those are just three of the reasons you should grab that notebook and pen and get writing a to do list! Look out for Monday’s post and video – I have an exciting book review/giveaway coming up, and this book has a particularly useful section on the benefits of list making. Are you a to-do-list-er? Let me know in the comments! Thanks so much for reading – have a great weekend! < Previous Study Tips: Backing Up Your Files! HA! Oh my gosh this is such a brilliant post! I am SUCH a to-do-lister! It really helps calm me down if I’m stressing about a workload to see what EXACTLY is left to do. That, and it is super satisfying ticking things off a list! Definitely one of those people who puts stupid little tasks on a to-do list so I can tick them off!! Aww I’m glad you liked it!! It just feels so good to see things disappearing off a list and knowing you’re getting somewhere! I love writing lists, I have constant to do lists and notebooks filled with things I need to do. I make one almost every day and I love it! I definitely find it helps to calm me down when I’m freaking out about all the things I need to do, and I love crossing things off, so satisfying!